APS have benefits, even for sighted pedestrians. 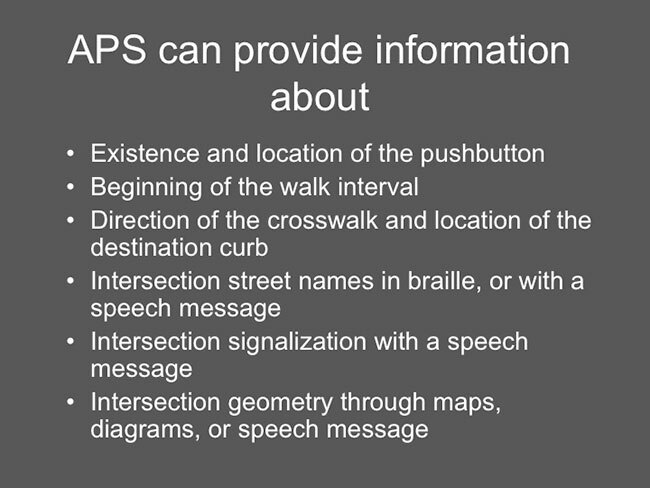 Sighted pedestrians have been found to start crossing more quickly and more uniformly where an APS is provided. English research (Wilson, 1980) found more consistent starts with a 20% reduction in starting delay when there was an audible walk indication. For blind pedestrians, results are more dramatic. They made more accurate judgments of onset of the walk interval. There was a reduction in number of crossings begun during DON’T WALK and reduced delay in beginning to cross when the signal changed, resulting in significantly more crossings completed before the signal changed. I think we can all agree it’s desirable to have blind pedestrians out of the street before the cross traffic begins moving. Results for blind pedestrians in the US were found as part of this project and other recent research projects.